This weekend we celebrated my Mum’s birthday. We didn’t fancy cooking and thought it would be fun to test the very limits of human patience via the waiting staff at a riverside restaurant, so we made a last-minute booking at Busaba Eathai in Kingston. We had envisioned a leisurely stroll along the river to the restaurant, perhaps hand-in-hand with the little ones (or even each other) joyfully tossing bits of bread to the ducks. After that would follow a peaceful, relaxing and educational experience whereby the kids sampled numerous Asian foods from the Busaba menu and thanked us for being such thoughtful and attentive parents with such broad cultural interests and the patience of actual real-life saints. In a parallel universe somewhere maybe that happened (but probably not. Kids defy even science). After a late one with guests the night before the kids were shattered and made it around, oh I don’t know, zero steps before their leg muscles caved in or their bones dissolved or whatever it was that stopped them being able to carry themselves along the flat path a few hundred metres. Carrying multiple children while wearing layers of winter clothing is a super-great workout, as it happens. We eventually fell into the restaurant, which happened to be already packed- always a good sign, methinks! On first impressions Busaba Eathai had thought hard about the decor and ambience and had done well in creating a pretty and glamorous take on the traditional Thai aesthetic*. The tables were well laid out and I always appreciate bench seating because a) it gives a nice communal feel to eating, b) the padding is usually comfy and c) it means we can put the three kids in the middle and an adult an each end for a kind of happy delicious restaurant-prison (until they disappear under the table, dangnabbit). The Busaba menu is also good, it has plenty of choice. We got the kids some juices which were waaay bigger than usual kids’ drinks and were totally fresh and in sweet little bottles. Check out my first two attempts at this photo that were sabotaged by Patrick and my brother. Busaba Eathai beer is apparently so good that they couldn’t wait 2 seconds for a sip! 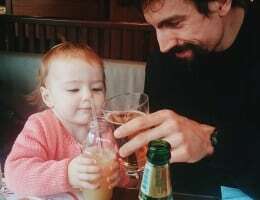 It was at this point that our youngest daughter decided to disappear under the table and make the kind of grunting noises that send a chill into every nappy-changing parent who was looking forward to eating just one meal without having to deal with someone else’s bodily fluids. Urgh. Anyway, I can at least now assure everyone that the baby changing facilities at Busaba Eathai are great; they’ve even got a hip bamboo-style changing table to fit in with the decor. Boden Mums, get here stat. It was all delicious, and the set menu comes with unlimited- I repeat, unlimited – sweet potato fries or rice. ‘Unlimited’ is obvs our favourite portion size, so we were all over that. The kids’ menu was excellent and we ordered three lots of satay chicken (“fancy some chicken lollipops, girls?”) with one each of rice, noodles and the sweet potato fries. They also got a really good colouring activity pack and junior chopsticks- be still, my beating heart. Is there anything cuter than watching a tot eat grains of rice one at a time with wooden tweezers? Obvs not. There didn’t seem to be a dessert menu, which we were a bit gutted about as I would probs walk through fire for sticky rice and mango most days of my life. There was the option of ice cream for kids but our eldest had fallen asleep on the bench and waking her up to eat would have meant swallowing an entire dish of Whinge-Laced Moaning, which I’m not a huge fan of. After our mains we settled the bill and headed home via one of the most hipster cafes I have ever seen (it was called ‘The department of coffee and social affairs’. For real). Thankfully our good credit meant we could take out a second mortgage to purchase a slice of red velvet cake, which was pretty darn amazing to be fair. Also apparently they send their staff to volunteer and give profits to charity and stuff so, fair play. I would definitely recommend Busaba Eathai as a great place to introduce kids to Thai food. We had three kids’ menus, three starters and five adult mains from the Busaba menu and a few beers and the bill came to around £120; not ‘cheap’ but I would say great value and a lovely place to celebrate an occasion. And the kids’ verdict? I guess the pictures say it all! 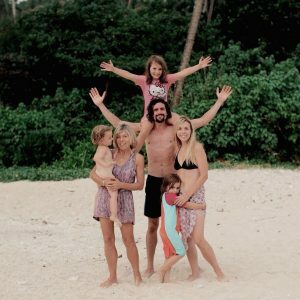 For more family travel posts and reviews from our full time travel trip across Asia and subsequent move to Bali, click the link here. Need somewhere to stay in London? We use Hotels Combined and Booking.com to get the best value accommodation; click on the links to see the current rates. Looking for London trips, tours and attractions? Check out Get Your Guide for the best of London; we use them on our travels for all-inclusive tours that offer better value than arranging drivers and guides ourselves! Need a map? Check out My London Map for a free interactive map of the capital. Disclaimer: I hope you enjoyed our Busaba menu review. Our visit to Busaba Eathai was not hosted, we booked and paid for our meal in full. All opinions about the Busaba menu and experience are, as ever, are our own.